Find the members of the family. This is a set of 10 sentences describing family relationships. Some of the harder words/expressions I used were "sometimes," "get along with," "engineer," and "adopted." Students have to read the description given below, and catch the letters to create the word. Riddle to practice family vocabulary. This game will help you to learn family related words. Look at the pictures and write the names of the places. Look at the pictures and complete the questions. Listen and unscramble the words. A nice activity to practice vocabulary related to family. A CROSSWORD TO FIND THE FAMILY MEMBERS. ENJOY! 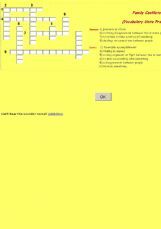 The crossword enables students (14-16) to practice vocabulary units and work with the dictionary.This puzzle is easy and can be fun for students.